Something is fishy at the start, the two U.S. brands list no ingredients. James Thomas Sarson was a vinegar maker living at Brunswick Place, Shoreditch in 1841. Sales rocketed when his son Henry James Sarson took over. It was renamed "Sarson's Virgin Vinegar" in 1884, referencing a Biblical story of the wise virgins. According to the Premier Foods website (the maker of Sarson's): "9 out of 10 chip orders are served with Sarsons in the UK", making our winner the the champion of choice in Great Britain and surrounding countries. In other words, further away from malt vinegar than Bud is to Ale. Sarson's is the real deal and is made from ale brewed from malted barley. It has a depth of flavour and smoothness similar to a Balsamic vinegar, which I confess I usually substitute in my chips since it is more widely available outside the UK. 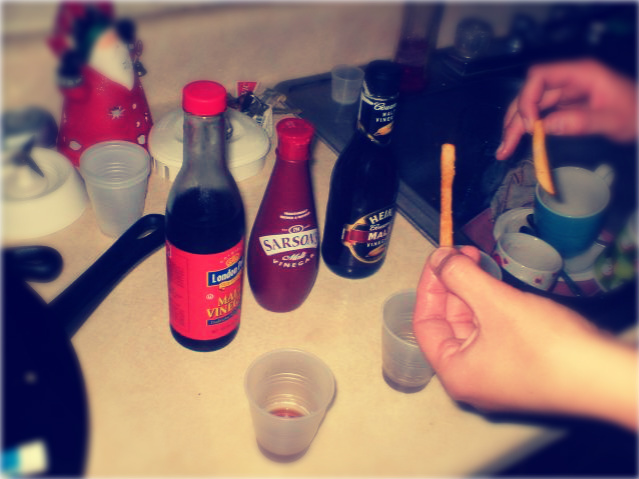 Even if you manage to find brewed vinegar, Sarson's taste is uniquely different than the competition. A difference between regular vinegar and, near wine quality, Sarson's being the "wine" brewed from authentic British water (unlike the others bottled in NJ and TX), tiered: flamboyant, followed by a sweet after-taste which Shannon describes it as "honeycomb". So in case you were wondering, the best malt vinegar is Sarson's.